Today I thought I would share a few little tidbits of things I have wanted to share, but never seemed quite enough to warrant an entire post on its own. My kids love popsicles. I bought some molds so that we can make our own. I had intentions of whipping up some smoothie or yogurt type pops, but have been too lazy. So instead I have been filling them with organic apple juice or lemonade. I personally like the lemonade ones the best. They think it is a big treat and I don't feel guilty about it. Every now and then my daughter's hair is difficult to brush after it as been washed. I used an old spray bottle and mixed about a tablespoon of conditioner (Jason's Aloe Vera) with some water and shook it up. Now I have leave in conditioner. I even use it on my hair sometimes when I have bed head. My kids also love yogurt pops. I buy the Horizon ones and freeze them. Their hands get so cold when they hold them. So I stick some old baby socks on the end to block some of the cold and it helps absorb some of the stickiness. I know I have more tidbits share, but it is late and I must go to bed. It will give me something to write about another day, right? I love that shot. He is REALLY getting into it! What a long trip you are taking! Hopefully you have good weather for driving. What part of MN are you going to? 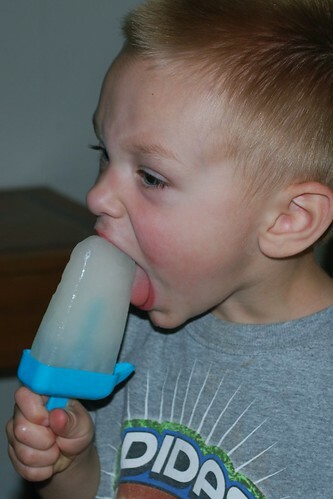 My kids love those homemade smoothie pops! (I get told I'm the best mom! ;) ). Found you via the stubby pencil site--I was thinking of ordering some crafty supplies.